Mischief night used to be one of my favorite nights of the year. It's the night before Halloween, and it's the night when people go out and cause mischief (i.e. : TPing, tagging, or just plain or sneaking out for a bit). Me and my friends never really did anything because we were too chicken (as always) but it was really cool just to wake up on Halloween and see a bunch of things that people did. One time someone filled the fountain at the local shopping mall with laundry detergent so that there were mass bubbles. For the whole of Halloween that year, big chunks of bubbles flew into the intersection. Mischief night in seventh grade (about four years ago) me, Serena, and her friend Kendal, went outside around 11 and just hung out in the drive way lighting off sparklers and tiny fireworks. We decided to take pictures to document the glorious occasion where we actually went out and did something (even though it wasn't that 'mischievous'). I was looking through pictures on my computer the other day and found a really strange one of me. In the photo you can see (if I hopefully downloaded it correctly) a bunch of smoke or mist and orbs. I assure you that I didn't smoke when I was in seventh grade (and still don't) and there was no fog that night or droplets of water hanging in the air, it was a crisp night. So that wouldn't explain the fog or orbs. Also, you can make out in the pictures some shapes. There's a shape above my head that looks like an outline of someone. And in the left part of the mist there's what looks like wings or something like that. The other night when I found this picture I showed it to Serena because I couldn't believe that I'd overlooked it. But she assured me that it was form the scratches on the camera's lenses. I believed her for a moment, but then realized that all the other pictures came out really well from that night, no orbs or smoke/mist in any of the other ones. I just thought I'd share this picture with you guys and see what you think! New Country, New House, New... Ghost? The following comments are submitted by users of this site and are not official positions by yourghoststories.com. Please read our guidelines and the previous posts before posting. The author, DollyDagger, has the following expectation about your feedback: I will read the comments and participate in the discussion. I believe you do have orbs/spirts around you and seem enjoy your fun there. Ok, I looked at the orbs more closely and I think that they're just dust. 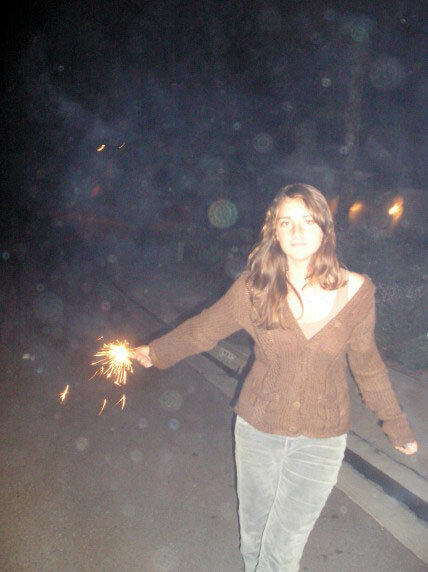 As for the smoke: it was probably from the sparkler. They do give off a small amount of smoke, which can be picked up by a camera with a flash. The fact that the shape of the smoke resembles a "ghost" is likely a matter of coincidence. orbs are the weakest bit of evidence you can find. I never look for orbs because 90% of the time it's dust. In your case it's smoke. I know you said you didn't see any smoke, but I can tell from the picture it was dark. Light smoke isn't visible at night to us. (thats why ghost hunters don't smoke on the job). As for the shadow behind you, I think it was just smoke too. Hello DollyDagger. I will have to agree with the others here that the smoke and orbs were caused by the fireworks. Thank you for sharing your story with us, I did enjoy reading it. Thanks for your feedback guys, I was just wondering what you all though! Sulfur or gun powder shards give off the most beautiful orbs. I have a small collection of photo's that I saved from my time in the military and in MOST of them, I can imagine shapes, faces and outlines of "evil beings"
This past fireworks holiday, we took photographs of the children, and the erratic way a sparkler burns is gorgeous by the camera shot. I am sorry, I have studied these photographs for a few days, and I truly believe that the smoke caused these outlines, and the sparks caused the orbs. I would have probably checked my lens on that one, to make sure it was really, really clean, lol... More than the usual amount of orbs! But, I wasn't there, either. If they are indeed orbs, you are very lucky to have that picture! Thanks for sharing such a great story. DollyDagger-thank you for sharing this story with us. You said that you and your friends were lighting sparklers and small fireworks. Did one of your friends light a firework not long before this picture was taken? I'm not saying that this is what has caused this, I was just curious as to where the fireworks were lit compared to where you are standing in this photo. Hi DollyDagger and thanks for sharing this story and photo with us! That really is an interesting photo you have there! When my big brother (18) saw this photo, the first thing he said was " fault of the camera" but when I showed him the outlines, even he was stunned! I can clearly see the outline of a person right above your head. You can see its head and shoulders but you can't see it's body because your head's coming in the way. There are many orbs, 3 big ones and more small ones. Where was this picture taken? If you find out the place, find out the history of that place and if somebody had died there or something. Thanks and if you find more pictures like this, please do post them! Thanks! Welcome to the site brainlessbandit, glad to have a skeptic on board, studying psychology at that, who may offer more down to earth explanations. Judging from the rainbow coloration of the orbs, I think that they're either dust particles or water vapor that you didn't feel. (I know you said it was not foggy that night but water vapor isn't always visible). I will examine this photo closer, but I don't think there is anything supernatural in it (besides your supernatural beauty. Heh heh). great pic, I see the "person" over your head. I can't wait to look at it on my home computer and spend some time taking it all in. © The ghost story Orbs In Photos From Mischief Night is copyrighted to DollyDagger. Edited by yourghoststories.com.